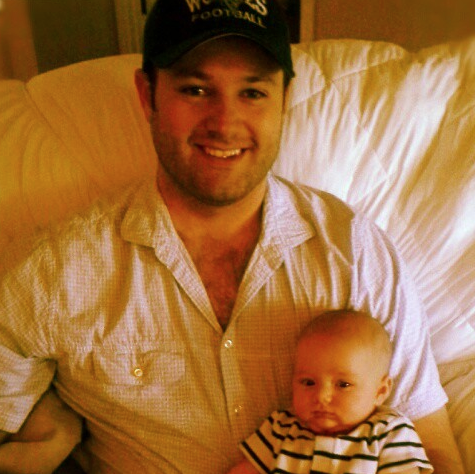 Today’s letter comes from Josh Norris, father of two boys and Mesa, Arizona resident. Josh is a Digital Marketing Specialist and owns his own business, Aftershock Enterprises. My name is Josh Norris and I am a father to my energetic sons, Joshua (3) and Zachary (1), and a husband to a beautiful, loving and wicked smart wife Jessica. I am a sports enthusiast that follows everything from MMA to Tennis, and I hold to a strong belief that life is just more fun when it’s football season. Above all I am a family man and being a Dad is the most rewarding adventure I’ve ever been on- my boys truly make life richer! As I write this letter you are currently 3 and 1. Your Mom and I had a master plan to have two boys, two years apart… one of the rare, if not only, plans we’ve made that has actually worked out. We couldn’t be more stoked to have such wonderful boys, and to watch you grow up together. That being said, today I want to talk to you about the joy and responsibility of being BROTHERS. There are few more important relationships in life that you will have than being a brother, and perhaps in its own right, it may be the most rewarding. This relationship is so important that I thought I would give you some guidelines on being a good brother, guidelines I wish I could go back and tell myself. The first thing you must know is, YOU WILL FIGHT. In fact, you already act like Tom and Jerry now (you will have to Google this reference at the time you read this). Fighting is a part of the bond that makes you brothers. Your Uncle T.J. and I used to be on the ‘bruise a day’ plan- meaning at least once per day we found a reason to tackle one another. I am not permitting fighting as an acceptable behavior, because it is not, but every time you do have a tussle, I can promise that you will make up. I remember when Uncle T.J and I were in Tucson hanging out with Grandma and she let us borrow her car (first mistake), and I let him drive (second mistake). Your Uncle is great at many things, but driving isn’t his strongest attribute. After having several near death incidents I started yelling at him to pull over, and out of frustration he stopped the car, proceeded to cuss at me, then threw the keys into a dark alley. Needless to say, it was on like Donkey Kong! 10 minutes later, we were back in the car (me driving this time), already having apologized to each other. Today, Uncle T.J and I still look back at that memory fondly. Only brothers can look back at situations like that with warm regard. The second thing you need to know is, you MUST STICK UP FOR ONE ANOTHER. Unwritten (now written) brother code states, “When someone threatens your brother, you get their back no matter what.” I remember a time a neighbor kid and his not-so-well chosen friends started picking on your then 14 year-old Uncle, Hunter. My inner hulk jumped out of my skin and had a “friendly conversation” that resulted in them never even speaking to Uncle Hunter again, and the neighbor kid’s dad coming over to… have a “friendly conversation” with me. The third thing you need to know is YOU WILL BE GOOD AT DIFFERENT THINGS. Chances are you will both have both talents and interests in different areas. It’s easy to find the common ground of what interests both of you. Right now you already have a good start with your love of toy cars. The two of you have amassed a car collection worthy of Jay Leno’s stamp of approval, and other than Zachary occasionally whacking Josh over the head with a car, you two are doing just fine. Still, as a brother, make a point to be supportive of interests and hobbies that you otherwise wouldn’t give a rip about. You both should pursue your passions to the fullest, and having your brother in your corner supporting you will give you the extra strength you need when times are tough. As you grow older you will have many friends, classmates, girlfriends, and co-workers that will come and go, but you will only have one brother. Keep these three tips in mind as you grow up together, and you will have a rewarding lifetime relationship.